Benjamin Graham taught that Intelligent Investors must do a thorough fundamental analysis of investment opportunities to determine their intrinsic value and inherent risk. This is best done by utilizing a systematic approach to analysis that will provide investors with a sense of how a specific company compares to another company or by reviewing the 5 Undervalued Companies for the Enterprising Investor. By using the ModernGraham method one can review a company’s historical accomplishments and determine an intrinsic value that can be compared across industries. What follows is a specific look at how Facebook Inc. (FB) fares in the ModernGraham valuation model. Company Profile (obtained from Google Finance): Facebook, Inc. (Facebook), is engaged in building products to create utility for users, developers, and advertisers. People use Facebook to stay connected with their friends and family, to discover what is going on in the world around them, and to share and express what matters to them to the people they care about. Developers can use the Facebook Platform to build applications and Websites that integrate with Facebook to reach its global network of users and to build personalized and social products. It offers advertisers a combination of reach, relevance, social context and engagement. Effective January 8, 2014, Facebook Inc acquired Little Eye Software Labs Pvt Ltd. Effective January 13, 2014, Facebook Inc acquired Branch Media Inc. In April 2014, Facebook Inc acquired ProtoGeo Oy, a Helsinki-based developer of software for smartphones. Effective July 21, 2014, Facebook Inc acquired Oculus VR Inc, an Irvine-based developer of virtual mobile gaming application software. 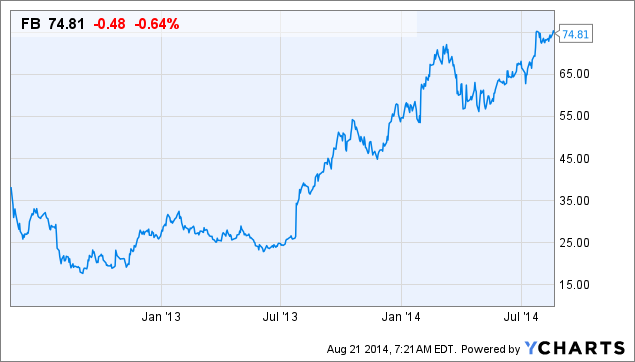 Facebook Inc. does not pay a dividend. Facebook qualifies for the Enterprising Investor but not the Defensive Investor. The Defensive Investor is concerned with the insufficient earnings growth or stability over the last ten years, the lack of dividend payments, as well as the high PEmg and PB ratios. The Enterprising Investor’s only initial concern is the lack of dividend payments. As a result, Enterprising Investors following the ModernGraham approach based on Benjamin Graham’s methods should feel comfortable proceeding with research into the company and comparing it to other opportunities. As for a valuation, the company appears to be overvalued after growing its EPSmg (normalized earnings) from $0.11 in 2010 to an estimated $0.58 for 2014. While this is a strong level of demonstrated growth, it does not support the market’s implied estimate of 60.24% earnings growth and leads the ModernGraham valuation model, based on Benjamin Graham’s formula, to return an estimate of intrinsic value below the price. Be sure to check out the previous ModernGraham valuations of Facebook Inc. (FB) for more perspective!